There are many different cleaning methods used in the industry today. Many are effective, but hot water extraction performed correctly will clean a carpet more thoroughly and will remedy a wider variety of problems. 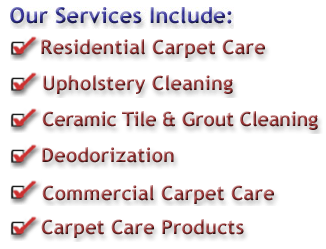 Hot Water Extraction (also known as Steam Cleaning ) is the method recommended by Carpet Manufacturers today. Today's carpets have very sophisticated twists to the yarns that scrubbing can distort and fuzz. Also, carpets are being made to last longer than ever, some as long as 25 years, because of this the major carpet mills state that Hot Water Extraction is to be used so as not to void your carpet's warranty. Some warranties will go as far as to require that certain cleaning agents be used and certified techs do the cleaning. To keep your furniture clean, it’s necessary to conduct routine maintenance, including periodic cleaning by a certified technician every 12 to 24 months. Furniture and fabric manufacturers recommend that consumers not wait until severe soiling occurs before cleaning because the greater the soiling, the less the likelihood of restoring the fabric's original color, appearance, and texture, and the greater adverse effect on indoor environmental quality. Upholstered furniture, in many cases, can contain a wider variety of soil than can be found in carpeting. Many of the contaminants in upholstery not only come from simple soil, but come directly from contact with human skin and animal fur. These soils contain high amounts of bodily secretions such as perspiration, dander, as well as skin and hair/fur oils. 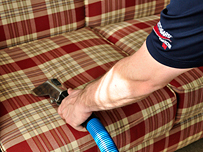 Therefore, keeping your upholstery clean is very important to maintaining a healthy home environment. Since upholstery can be made of more delicate fabrics, such as cotton, silk, and rayon, and can contain sensitive dyes, upholstery cleaning requires more advanced education to ensure quality results. 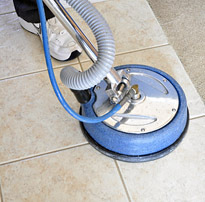 We now introduce a new service to our customers, Ceramic Tile & Grout Cleaning. This amazing new process makes tile and grout cleaning child's play compared to old methods. No more scrubbing on your hands and knees with every cleaning product in your closet only to be satisfied with so-so results. Our cleaning process utilizes the same truck mounted machine but with a new set of specialized wands and tools along with a revolutionary new cleaning agent that cleans grout lines like new without etching to prevent rapid re-soiling. Now you'll understand why you painted the walls that color. This service is especially important when selling a home to give the kitchen and bathrooms a bright clean look. Give us a call if you've always wondered what color that grout is supposed to be. the effects of acid dyes but keep in mind even protection like this can still be damaged by very aggressive spot cleaners. Carpet Protectors have a tolerance of up to a pH of 10. Most aggressive spotters have a pH of around 11, in order to remove the most common spots, children's fruit juices. These High pH spot cleaners can even begin to strip away protection that was applied at the carpet mill. If the carpet does not have a high grade of stain protection the best case scenario is to leave the stain until it can be dealt with by a professional cleaning company. A professional will have special carpet treatments to suspend the spot so cleaning won't set it. This is our economy package, often used by customers who are moving. This package is geared for the customer that cleans more frequently than once a year.. This is our most complete cleaning package with all the steps in our Silver package plus 3M Scotchgard Protector and an extra rinsing to remove old detergents from past improper cleanings and spot cleaning residue..